Across Canada, Edmonton is rapidly becoming known as an energy sustainable city. 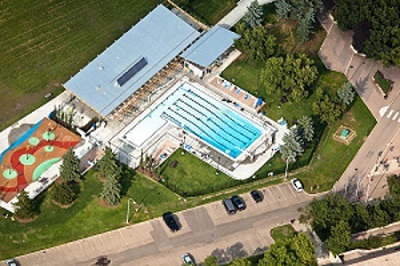 In an effort to continue making Edmonton green, the City, along with its business partners, has launched a Solar PV pilot project at Queen Elizabeth Outdoor Pool. The pilot consists of installing 200 solar panels on the roof of Queen Elizabeth Outdoor Pool. The panels convert sunlight into usable electricity and help significantly reduce greenhouse gas (GHG) emissions and decrease energy consumption at the facility. This initiative is another tool used to support the newly Council-endorsed Community Energy Transition Plan (ETP) whose goal is to limit our city’s negative impact on the environment. The panels will generate about 50,000 kilowatt-hours of electricity annually, which accounts to roughly 40% of the electricity used by the pool annually. This is expected to avoid, on average, 34 tonnes of GHG emissions per year. That is equivalent to saving the electrical power consumed by 7 residential homes annually. The results of the pilot will be closely monitored by the City Office of Energy Management and the results will be evaluated to determine best practice processes for ongoing performance reporting and the future installation of solar panels at City facilities.